Both Coccimiglio and Nobile have then remained in the music biz, playing around the world for years. Vincenzo Coccimiglio has also been a teacher in Music Studies and a composer, having released many solo projects in the electronic music field. He sadly passed away in 2012. Very rare and expensive in its original issue, 1998: La storia di Sabazio was housed in a nice mirror golden foil gatefold cover, and is very hard to find in perfect condition due to the delicate design. Much easier to find are the Korean (Si-Wan SRML 5001) and Japanese (Nexus/King K25P 414) repressings, the latter exists both in single and gatefold version with the same golden foil cover as the original. Also two Japanese CD versions, King K32Y 2120 and Strange Days 1005, the latter with mini-LP cover, exist. The original Italian CD reissue by Vinyl Magic, deleted since long, has finally been replaced by a nice one in the BTF "Italian progressive rock" with gatefold cover, obi and illustrated booklet. The same label has issued in 2010 a new LP version, with the first 500 copies on golden vinyl. 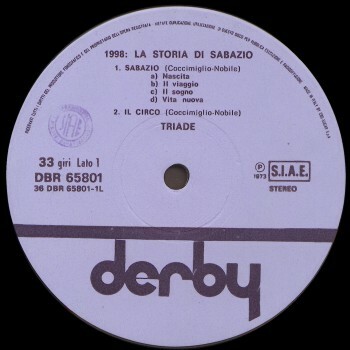 As many other albums at the time, 1998: La storia di Sabazio was also released on cassette tape and 8-track versions, the last one carrying the date 1974. 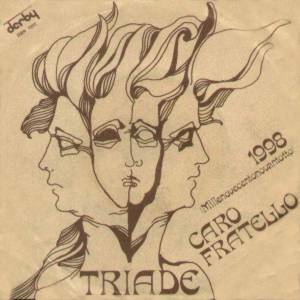 I used to go at the Space Electronic in Florence, where many foreign bands like Canned Heat and Van der Graaf Generator played, and I met Tino Nobile there, who had played with Noi Tre. He was 24 at the time, and I was just 18, but we played together and we liked the material each of us had written and decided to form a band. We auditioned many drummers, but the music was too difficult to many, one of them even threw away the sticks saying "What kind of music is this?". Then we found Giorgio Sorano, and he played all the drum patterns we had written. 2-Who was the main composer in the group? Both me and Tino, we were credited as composers for all the tracks on the album, but it was me who wrote the suite on the first side, while the songs on side 2 were written by him, we both arranged all the compositions. 3-How did the deal with Derby and the album come out? We were contacted by producer Elio Gariboldi and in just three days we had a recording deal. They had thought to contact Crepax [popular Italian comics designer, who also made the cover for Nuda by Garybaldi] to make the cover, but in the end it was designed by Giorgio Sorano's wife Florinda. It was a very expensive cover, with that golden foil. 4-How come the musicians' names don't appear on the cover? I don't know, it was probably the record company's decision, but me and Tino appeared as composers for all the tracks. 5-Did you promote the album with concerts? Yes, we played many support dates to Banco del Mutuo Soccorso, and these were very good, every time we were called for an encore. We even supported PFM, I don't remember where, and played with some other artists at Pierlombardo in Milan, I just remember Battiato among them. Again at Pierlombardo I can remember some very good concerts we made on our own, and the album had a lot of airplay on Radio Montecarlo. 6-What happened after the LP release? One of our managers left us, and another wanted to take us abroad, in Germany, to play a more commercial kind of music. There were contrasts in the band, so after a while we decided to split. 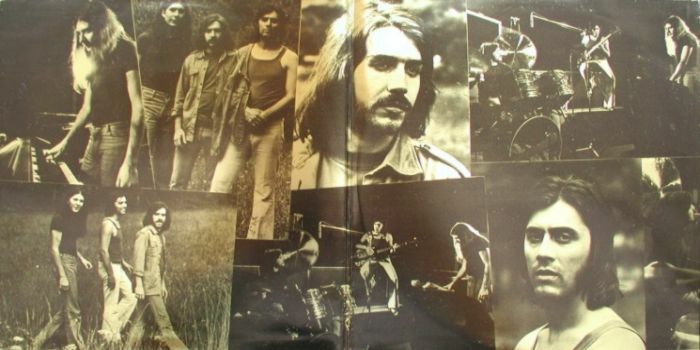 Someone asked me to join Dik Dik who were looking for a keyboardist at the time, but I didn't accept and Joe Vescovi [from The Trip]was taken in. 7-What have you done after Triade? I never gave up playing, I graduated at DAMS [University of Bologna, the Arts and Music Department] and worked as a teacher for some years. Then I became a professional piano bar musician, and played all over the world, just like I know Tino Nobile has been doing. 8-Any plans of reforming Triade? Well, I've been contacted by Giorgio a couple of years ago, and even Tino asked me many times if I wanted to do it, but I don't think we'll ever do something again. 1-The group Noi Tre is often referred to as "legendary". What are your recollections of that group? I had recently left my band I Mostri along with guitarist Franco Falsini, it had been our first group. One day in the spring of 1966, early in the morning, Franco and drummer Pino Pini, came to my house. I was sleeping and my mother told them to come back later, but they insisted and she let them in. I found them close to my bed, frantically muttering and being sleepy I didn't understand what they meant. In short, the owner of the La Siesta club (it was back then the most popular in Florence and Tuscany) had asked them to form a trio. He had also found the name that we adopted: Noi Tre. The number of musicians in the band was not due to musical, but simply financial reasons: three musicians cost much less than four or five. Out of this meager economic expedience the first trio in the story of the world pop-rock was born. In fact the first Jimi Hendrix album, Are you Experienced ?, was released a year later, in 1967. In the beginning our reprertoire was based on songs by the British group Pretty Things (totally unknown in Italy at the time – Pino had bought their records in England), then by Jimi Hendrix and Cream. There were also some original compositions, but rather trivial. This was due to the fact that in England and USA the rock bands existed since the 50's, while in Italy we were very good in composing melodies and harmonies, but totally illiterate in pop-rock music. The ian aspect in Noi Tre's music was the improvisation. There were memorable bass and drums solos. Pino was one of my best partners musically speaking, precise as a clock and with a nice swing, he followed, without a single mistake, all my rhythmic excursions. This was, probably, the real soul of Noi Tre, what made us so original. Franco, despite not standing out like many guitarists of that time, had the charisma of the lead player. A small note to point out: with my bass I had to fill up the lack of a rhythm guitar and this was a big challenge for me. It was during those few days of rehearsals, in the small garage of Franco's father, that I started playing two or three strings at the time on the bass like chords. Later on I developed a different method. Tapping the strings with my thumb I got two sounds: the metallic bang of the string on the fretboard and the natural sound. Having almost never used a pick, I played the trills with my second and third finger. These tricks surprised even some British groups that saw us live, like the Motowns and the Primitives. At the RCA studio in Rome we were the first in Italy to record bass and drums with a "British sound", or even more aggressive and original, and the great engineer Gaetano Rea (he had even recorded an album by Frank Sinatra) made his best to follow us in the recordings. Our recordings (original songs lost forever, or so I think) were played to some of the UK musicians working for RCA and they were hit by the strong musical and playing quality and decided to use the same engineer. This is story that Gaetano himself told me when I met him some years later. There was undoubtedly a natural musical excellence in Noi Tre, even if a bit unpolished, but we weren't backed by the experience of a great producer, so we went lost in the obscurity. I was just 17, Pino and Franco a bit more than 20. 2-How did you form Triade? After the experience with Noi Tre I played with many bands working in dance halls. For some years I played at the Space Electronic in Florence with some groups formed by me. It was during this time that Vincenzo came to see us. He was 19 then and introduced himself as keyboardist and composer. I went at his home, he played me his compositions and I played him my songs (written when I was 15-16 years old, hence in 1964-65). We though that the Italian melodies mixed with the virtuosity of Vincenzo's compositions, could find the ir place in the national musical scene. We rehearsed in his living room, I used a small bass amplifier. When everything was finished we found a drummer, but it wasn't easy to find one who could play like I wanted. The music divisions were rather unusual, in fact Giorgio Sorano just became convinced of our compositions when we recorded at Rossi Studio in Milan, with Elio Gariboldi as producer. 3-Songwriting was credited to you and Coccimiglio. How did you work together? Vincenzo, younger than me, didn't have the same experience I had gained in previous years, for this reason it was me who had to manage the musical and organisational aspects. Coccimiglio was still a novice, but he had an extraordinary talent, a great enthusiasm and was strongly determined to reach the success. He deserved it, because he was one of the best keyboardists around. His compositions were born out of his love for Bach (borrowed from Emerson as well) and Chopin. While the Italian musicians took their ideas from the pop music that could be heard in those years, it was different for me. I was a student at the Cherubini Academy of Music in Florence, double bass and composition, so I was inspired, for the arrangement of the bass and drums parts, by my past experience as well as Stravinsky, especially Le Sacre du printemps. These aspects gave originality to our music. I took the inspiration for the lyrics from one of the French poètes maudits, Arthur Rimbaud (whose thought is light years far from mine now). The arrangements of the instrumental part were mostly made by me. The B-side contains my songs and while the organ and piano parts are by Vincenzo the overall arrangements are mine. There was a strong personal and professional mutual respect and we fully agreed on everything, without a single discontent. The only friction happened when he and his father wanted the lyrics to be credited to both of us. This didn't happen, but there was no disagreement and everything went back well as before. 4-What do you recall of your relatiions with the record company and the album producer? It was me who contacted Gariboldi by phone asking for an appointment. By the way I used a small trick to avoid receiving the same old apologies (remember that there were lots of new groups coming out every day, at the time) which would have denied us the chance of a meeting. I lied to Elio, telling him that Riki Maiocchi of I Camaleonti had made his name as a very good producer. So, after many other phone calls from Florence, Elio, along with a collaborator, came to see us. I waited for him to arrive at the Florence North motorway exit on my bike and he followed me up to the Space Electronic. At the end of the audition Elio, rather euphoric, confirmed our contract. Gariboldi was a very good person, who sadly passed away last year. 5-How do you rate the record promotion by your company? When Gariboldi was still in Milan it was very good, but after a few months the record company sent him to Munich. Before leaving Elio gave us the name of another producer, Lombroso, who asked us to turn to a more commercial kind of music. We didn't accept but, considering the Italian market, he was right. 6-How were your relations wit the musicians from the other pop groups? There were very good relations between good musicians, but the envy prevailed sometimes. During a concert in Perugia, where we had to open for PFM, they were not so kind to us. As soon as they heard us play, during the soundcheck in a football field, they decided we couldn't use their PA, despite our agent had agreed this. So we didn't play. On the other hand Banco del Mutuo Soccorso behaved with us - excuse my pun - in a noble way. We opened up for them. When we came to the backstage they embraced us. 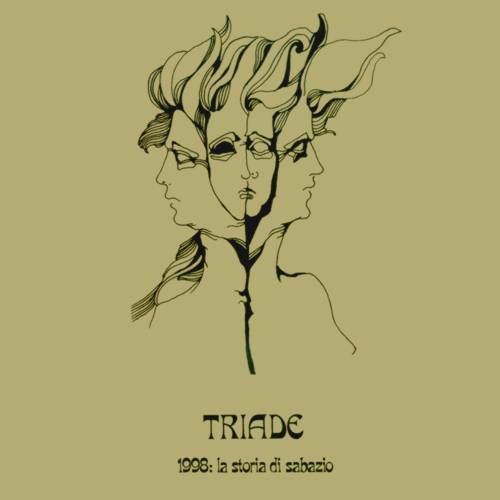 They were so professional, hence totally devoid of envy, that, before starting their fabulous concert, singer Francesco di Giacomo publicly commended us, adding: "after the wonderful music of Triade, we hope to have the same silence and attention that you had during their performance". 7-How did you reach the decision of breaking up the group? It was the right time to change. As I said, I studied at the Academy of Music and the commitment was stronger every year. It was somehow a natural separation, so that with Vincenzo we stayed in touch and with good relations. I once wrote, on his request, a song that he added to others to submit to someone in Milan. But it didn't go well. Record companies have always suffered from cover-illness, original products, even of great quality, are never appreciated. You always have to sound like someone else who's already successful. Otherwise the say you sound too old, or that your style doesn't sell well. Back to Triade, I can say we had a very enjoyable, if not exhilarating, human and professional relationship. Between the two of us there was a musical and human harmony and jokes and laughs were everyday stuff. We never were together more than half an hour without a joke to minimize a situation, or just for the fun of it. 8-What did you do after the end of Triade? I'd need a book to telle everything, so I'll just mention the essential. To support my studies in 1975 I formed another trio (it was an obsession): guitar, bass, drums. Quite probably this was one of the most popular groups in Tuscany in those days (I still have some live recordings of original tunes). I formed the trio with the excellent drummer Piero Masi who, thanks God, could read the music I wrote, and guitarist Robert Saunders. The latter was a country music specialist that I discovered and converted to the progressive rock. Our music was original and the English lyrics by Robert. Right before my graduation I left rock music and played as first bass in Classical Orchestras, both in Florence and, during the summer, the rest of Italy. At the same time I was invited as art director of the Dinner Theatre Monna Lisa in Florence, and for three years I organised and produced many shows with a group of around 37 artists, including some dancers of the Teatro Maggio Fiorentino. Choreographies were by a Belgian woman, the costumes for the modern ballets, just like the subjects and musical themes were all chosen and looked after by me. After all these experiences I wanted to realize the dream I had since child, to travel and know other cultures. After 10 years as an orchestral musician and teaching in the schools, I left everything and started playing piano bar around the world, the only job who allowed to fulfill my dream. Periodically I lived in Los Angeles where I recorded one of my songs for a Latin-American female vocal trio, Chicass. I wrote a ballad for Barbra Streisand and another for Bocelli (whom I personally knew, so professional and humble that he even praised me). My compositions weren't published for professional hitches of these artists (when you don't have a lucky star...). Streisand's manager was particularly kind to me, he suggested to give the song to another of his agency's artists, Placido Domingo, who could certainly sing it without spending many years as Miss Streisand used to do. But here it was not my unlucky star, but my stupidity that made me refuse it. 9-How do you judge the current interest for 70's music and the high value thet collectors give to your and other Italian prog records ? All this interest is surely good. The money is part of the collectors' job, I agree with it, as long as it is not just a lucrative affair. Many thanks to Vincenzo Coccimiglio for the precious information given, rest in peace Vinny! Also a big thank you to Tino Nobile for the help and the interview and to Enrico Rosa (http://www.enricorosa.com) from Campo di Marte, whose good memory helped us to unveil the musicians' names after a long research. 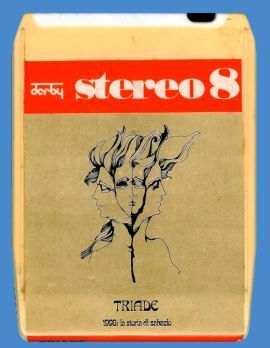 Thanks to Mauro Degrassi for info and picture of the 8-track version.